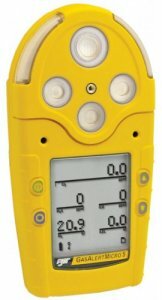 GasAlert Micro5 PID portable gas detector simultaneously monitors up to five atmospheric hazards including volatile organic compounds (VOCs), oxygen, combustible gas (% LEL), and a wide selection of individual electrochemical toxic sensors. Compact and lightweight, GasAlertMicro5 PID activates audible, visual and vibrating alarms in the event of a low, high, TWA or STEL alarm condition. VOCs present multiple potential threats in the workplace environment. VOCs are characterized by their tendency to evaporate easily at room temperature and include substances such as solvents, paint thinners, benzene, butadiene, hexane, toluene, as well as vapors associated with fuels such as gasoline, diesel, heating oil, kerosene, and jet fuel. 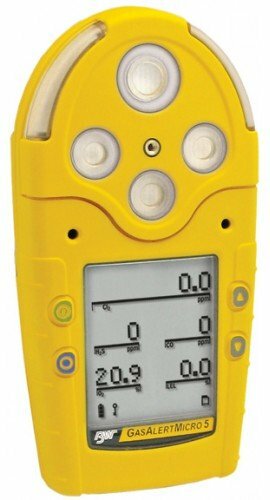 The GasAlertMicro5 PID's integrated photoionization detector (PID) enables sensitive broad spectrum monitoring of volatile organic contaminants. Highly configurable to suit a range of applications, GasAlertMicro5 PID comes as a diffusion or pumped instrument; with either alkaline or NiMH rechargeable hot-swappable battery pack and has optional datalogging capabilities. Standard features include confidence beep, automatic calibration, full function self test, and an extended selection of user-settable field options, plus a simple automatic calibration procedure.